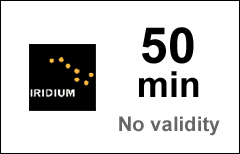 The Global 50-min airtime voucher refills your active Iridium Global prepaid account with 50 minutes of voice calls. Maximum Age Limit. The Maximum Age Limit of the minutes in this Global 50-min voucher is 3 years.